The diamond is the hardest natural substance known. It is found in a type of igneous rock known as kimberlite. The diamond itself is essentially a chain of carbon atoms that have crystallized. The stone's unique hardness is a result of the densely concentrated nature of the carbon chains. Like other igneous rocks, kimberlite was formed over the course of thousands of years by volcanic action that occurred during the formation of the earth's crust. Kimberlite is located inside these former spheres of volcanic activity—often near mountain ranges—in vertical shafts that extend deep inside the earth. Inside the kimberlite are intermittent deposits of diamonds, one of several minerals present. However, not all kimberlite contains diamond. Other stones often found with diamonds are mica, garnet, and zircon. Kimberlite may be blue-grey in hue—thus termed blue ground —or if exposed to air it may have a yellowish cast and is called yellow ground. It is thought that diamonds were first discovered in Indiaabout 6,000 years ago in the riverbeds of the region. Traders were responsible for bringing the gems as far east as China and as far west as Rome during the classical and early medieval eras. The Chinese were the first to hamess the unusually tough nature of the gem and used it as a tool to cut other stones. Pliny the Elder, a Roman scholar, wrote about the diamond in the first century. The word itself stems from the Greek term adamas which means "invincible" or "unconquerable." From the earliest days, the diamond has been imbued with mystery and superstition. Because they were so rare—at first found only in India—it became a commonly held superstition that the diamond lent its wearer special powers. They were worn in battle to insure victory and sometimes invoked as an antidote to poison. Other superstitions associated with the stone included the caveat that placing it in the mouth would bring on a loss of teeth. In other cases, finely ground diamond, made into a powder, was thought to be an effective poison. Indeed, experts agree that even in a pulverized form, the unique sharpness of the mineral would tear minuscule holes in the digestive tract. Because it is both the hardest and one of the rarest natural substances, diamonds have always fetched exceedingly high prices. The extreme value of the stone also made it a portable form of wealth in times of warfare and upheaval. The actual mining of diamonds as an industry can be traced back to India to around 800 to 600 B.C. India was the only known source of the rocks for over a thousand years, until they were unearthed in Borneo around A.D. 600. During the Middle Ages, the diamond was overshadowed by some of the more colorful gems like the ruby and emerald. These other stones found their way into the jewelry of the rich and powerful of Europe more easily than the diamond. Additionally, gem-cutting techniques had not yet been developed to unleash the brilliance of the stone. Diamonds were usually left in their natural state or shaped by a rudimentary cut. In the 17th century, how-ever, a Venetian lapidary named Vincenzo Peruzzi developed the so-called brilliant cut. This cut revealed the intricacies and the natural perfection of the stone. Diamond is found in a type of igneous rock known as kimberlite. Like other igneous rocks, kimberlite was formed over the course of thousands of years by volcanic action that occurred during the formation of the earth's crust. Inside the kimberlite are intermittent deposits of diamonds, one of several minerals present. In the 18th century, diamond deposits were discovered in Brazil in small quantities, and later in Australia, Russia, and the United States. Brazilian gems were first taken to India and shipped to Europe as Indian diamonds, since people considered non-Indian gems less valuable. In the 20th century, an American mine near Murfreesboro, Arkansas, was open for novelty public mining for a small fee. High-quality diamonds have been found in Siberia, but the extremely cold temperature has made large-scale mining unfeasible. In 1866 the world's largest cache of diamonds was discovered in South Africa. Some children had found a rock and brought it home, and a curious neighbor passed it on to a trader, who gave it to a geologist. It was discovered to be a diamond of enormous size and worth a small fortune. South Africa soon experienced a diamond rush, and shanty towns sprang up with the influx of prospectors. Eventually, the various mines and mine companies of the region were consolidated under the control of the DeBeers organization. With the DeBeers Consolidated Mines, Ltd., a Central Selling Organization, and a Diamond Trading Company, this conglomerate controls about 80% of the world's diamond output. Contemporary diamond mining is centered at Kimberley, South Africa, and carried out by DeBeers. Every six weeks or so, representatives of the DeBeers Diamond Trading Company invite a special list of diamond wholesalers—less than a hundred world-wide—to London to view preselected lots of the gem. 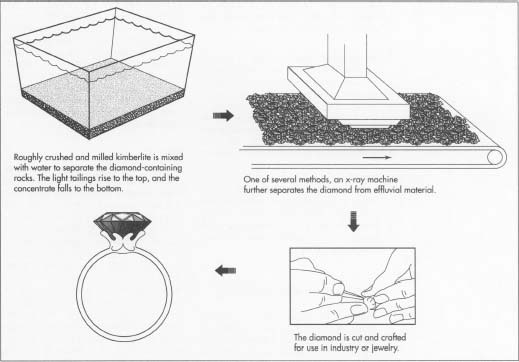 This is the only method by which South African DeBeers diamonds come onto the market. tools last much longer than those made from other sources and offer a nearly unmatched precision in cutting other substances. Additionally, such tools work faster and much more quietly than other alternatives. Tools made from industrial diamonds are used in the mirror and optical manufacturing fields as well as in gas and oil drilling endeavors. In the textile industry, devices made from diamonds are used to cut patterns. In medicine, cutting instruments made from diamonds are used to cleanly slice bone and tissue. The construction industry uses diamond tools in the grinding and cutting of concrete and pavement. Diamonds are also used to make needles for stereo record players. Diamonds are chains of carbon. Carbon is one of the most common substances on the planet. In one form it is simple graphite, used in pencils, but in its crystallized form, it takes an altogether different appearance as diamond. On the scale used by mineralogists to measure the hardness of minerals, diamonds rate ten on a scale of one to ten. Diamonds are measured in carats, the standard unit of measurement for gemstones. One carat is roughly equal to one-fifth of a gram. The carat can be further divided into points based on a scale of 100. One of the reasons diamonds are so prized is because the light they absorb is reflected directly back outward, if the stone has been properly cut. The unusual crystal structure of the gem allows this high degree of refractability. Because of their structure, diamonds are also excellent conductors of electrical current. Structurally, the diamond can be described as an octahedron. This means that there are double four-sided pyramids of carbon chains inside that meet one another at the bases. Cubes or dodacahedrons—a twelvesided shape—are also found within the stone. Sometimes small triangular pockets called trigons can be observed. Diamonds are found in nature in a variety of hues. Colorless or white diamonds are the most common, while some tinted stones are rare and valuable. The shades may be yellow, blue, pink, green, or amber. In South Africa it is common to see orange diamonds as jewelry, but this is a custom that has not made its way into the rest of the world. Some of the world's most famous diamonds are the colored ones—the heavy Dresden Green, for instance, and the infamous Hope Diamond. The latter, blue in color, is thought to hold certain negative energy, and many unexplained deaths have been associated with its owners. It is now in the collection of the Smithsonian Institution in Washington, DC. Diamonds are mined either from the kimberlite pipes below the earth's surface, or from alluvial deposits. Alluvial (riverbed) deposits occurred when volcanic action carried kimberlite and other minerals from the center of activity to naturally forming irrigation systems. Such diamonds are found quite near the earth's surface. In alluvial mining, considerable amounts of sand must first be removed from the area. The sand and other such components are called over-burden, and large mechanical scrapers are used to move it out of the way. Underneath the overburden lies a gravel bed, and bulldozers scoop the gravel up and set it aside in piles. The piles are then taken to a screening plant, where the diamonds are extracted. In alluvial mining, it is sometimes necessary to reach the bedrock underneath the gravel bed—or sometimes even below the bedrock itself—in order to unearth the diamond deposits. The bedrock must be thoroughly searched. Sometimes an enormous vacuum device called a Vacuveyer is used for this purpose. As the mining process moves along in a horizontal fashion, the removed overburden is again deposited to fill over the excavated sites. Below-ground mining of kimberlite for diamond also requires moving enormous quantities of rock and other material in order to unearth gems, but on a much larger scale than alluvial mining. For one part diamond uncovered, it is estimated that 15 to 30 million parts waste must be moved out of the way. Unlike mining endeavors for gold or other substances, engineers cannot determine beforehand whether an area has a large abundance of diamond. 1 Block caving is the most commonly used method in excavating diamonds from kimberlite deposits. This method offers the highest yield and thus is the most cost effective. First, a large vertical hole is excavated, typically 1,750 feet (533 m) in diameter. Levels are placed approximately every 40 feet (12 m). Along these levels are horizontal tunnels known as scraper drifts. In the drifts, there are small inclined coneshaped openings at intervals of every 11 feet (3 m) or so. These openings are roughly four feet by four feet. When a horizontal slice is cut above the cones—usually about six feet (1.8 m) in height—the kimberlite begins to break off and fall into the cone and into the scraper drift. The material is then pushed onto trucks. The trucks travel underground through the mining area and take the collected kimberlite to a crushing device. 2 In the crushing operation, which occurs in the below-ground mining facilities, large chunks of kimberlite are broken up into more easily transportable segments. After an initial crushing, the kimberlite passes through a grizzly, or a set of iron bars. If the crushed chunks do not pass through the grizzly, they are still too large, and they are sent back for further crushing. 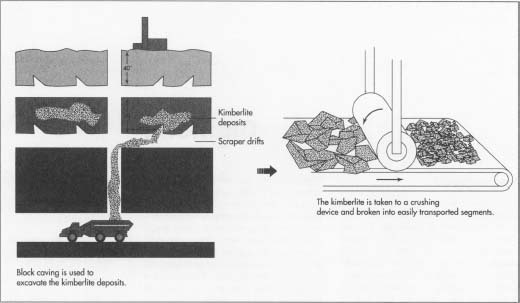 The crushed kimberlite is then taken above the surface for further processing. When no more kimberlite is found entering the cones, the area is depleted and work moves on to a lower level. 3 The actual diamonds must be separated from the rock that surrounds them. Crushing or milling the excavated material is the first step, but this is done in a rudimentary form so as not to damage the potential gems inside. Next, a gravity-based device is used to sort the diamond-containing portions—called the concentrate—from the tailings, or the filler rock. One of the most commonly used methods to separate the two is a type of washing pan developed in South Africa in the 1870s. Decomposed kimberlite and water—in a mixture known as a puddle—is put into the pan. The mixture's viscosity is a crucial element, because the lighter particles will rise to the top, but the diamonds and other heavy minerals will descend to the bottom of the pan. Another method of uncovering diamonds uses media separators. A stew called a slurry is made up—typically consisting of water added to the crushed concentrate and tailings. Ferro-silicon powder, which has a heavy density, is also added. The slurry may be put into one of three types of media separators. The first is a cone-shaped tank, with a cone-shaped agitating element inside. The agitator moves around the sides of the tank, but leaves enough room so that the lighter tailings can rise to the top and the heavier elements sink to the bottom. In a lifting-wheel type of media separator, a wheel is filled halfway with slurry. Paddles inside it agitate the mixture, and lift the heavy particles from the bottom and separate them from the rest of the mixture. The third type of media separator is known as a hydrocyclone. It is a large vat that spins around, and through centrifugal force, the heavier, diamond-rich particles are separated. 4 After this rudimentary separation, the concentrate moves to a greasing area, another innovation in diamond manufacturing developed in South Africa in the late 19th century. Mixed with water, the kimberlite-and-diamond mixture is placed on a greased belt or table. This device is usually slanted and vibrated. The method operates on the premise that diamonds newly excavated will not become wet when brought into contact with water. Instead they will stick to the grease. Petroleum jelly is usually the preferred substance on the grease belt or table. The water then carries away the remaining non-diamond particles. The diamond-laden concentrate is then swept off the table and boiled to remove the traces of grease. In a newer method, X-ray technology is used to determine which of the concentrate is diamond and which is effluvial material. 5 Chunks of diamond eventually become small, perfectly shaped gemstones commonly used in engagement rings and other jewelry. Since diamond is the hardest known substance, diamond dust must be used to cut the stone. In cutting, a minuscule groove is incised into the surface of the diamond, and a cleaving iron is inserted into the groove. With a quick, forceful blow, the diamond should split perfectly along its naturally occurring planes. The lapidary determines further cuts by marking them off on the surface with ink. Next, a diamond saw, oiled with the unusual combination of diamond dust and olive oil, is rotated vertically on the surface of the raw gem. This device divides the diamond into new segments. These parts are then fed into a lathe-like device for grinding. Diamonds are a finite resource. The fate of Indian diamonds is a good example of what the future might hold for the South African diamond-mining industry. From the first discovery of the gems in India until relatively recently, it is thought that over 12 million carats originated from India. By the mid-20th century, the resources were nearly depleted, and India was producing only about 100 carats annually. Diamonds will continue to be used in industry and high-technology enterprises, but synthetically produced facsimiles—first manufactured in 1953—may accomplish some of the tasks originally the exclusive province of the real stone. These "manufactured" gems have the same properties of hardness and durability, and while they will never be as popular as the real diamond for adomment purposes, they are well suited for industrial applications. Arem, Joel A. Gems and Jewelry, 2nd ed. Geoscience Press, 1992. Austin, Gordon T. "Diamond." American Ceramic Society Bulletin, May 1990, p. 854-55. "More Australian Diamonds?" Engineering and Mining Journal, November 1992, p. 62. "Diamond Exploration—The Trace Element Revolution." Engineering and Mining Journal, July 1994, p. 7. Galli, Giulia, Richard M. Martin, and Roberto Car. "Melting of Diamond at High Pressure." Science, December 14, 1990, p. 1547-49.
this is great. thank you sooooo much! i had to write a report and had no idea where i would find info on diamonds. thanks again.